Like I mentioned in the intro above, Kenneth needed a unique solution. 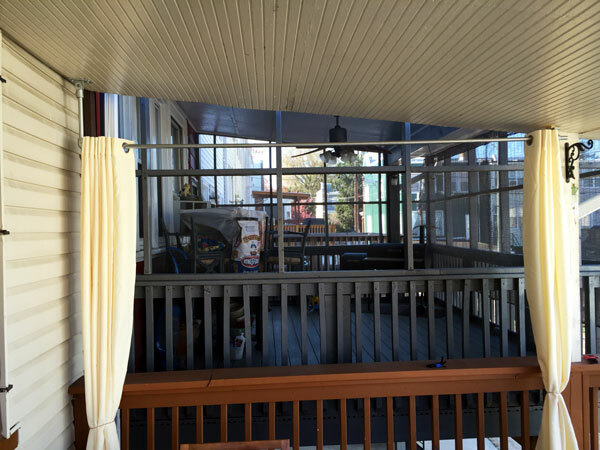 He wanted to mount curtain rods to the ceiling above his covered deck but finding some that would fit a sloped ceiling was a challenge. That's when he came across Simplified Building and figured he could build his own. The result are these beautiful curtain rods that were made possible due the unique ability of Kee Klamp's Swivel Flange. The fitting features a flange with a range of motion of a 160 degrees, allowing Kenneth the ability to match the slope perfectly. Ultimately, Kenneth loved how they turned out and appreciated the "gratification of completing the project" himself. Below, you will find the fittings and pipe you will need to build the angled, ceiling mounted curtain rods like the one Kenneth built. However, if you're attaching to a flat surface, then you can simply use two Rail Support fittings, instead of one Swivel Flange and one Rail Support fitting. This combination will allow you to mount the curtain rod to a flat surface. Pipe. The curtain consists of one shorter length (to make up for the slope height) and one longer length of pipe (functioning at as the actual curtain rod). There are two ways to assembled the curtain rod. The first involves assembling the curtain rod first and then attaching it to the ceiling. The second involves attaching the two fittings (used to support the curtain rod, in this case, the Swivel Flange and Rail Support fitting) to the ceiling first and then assembling the rest of the curtain rod from there. For simplicity's sake, and the purpose of this tutorial, we will be showcasing the steps to assemble the curtain rod using the first method. But, it's entirely up to you how you approach the process. First, start by assembling the curtain rod. 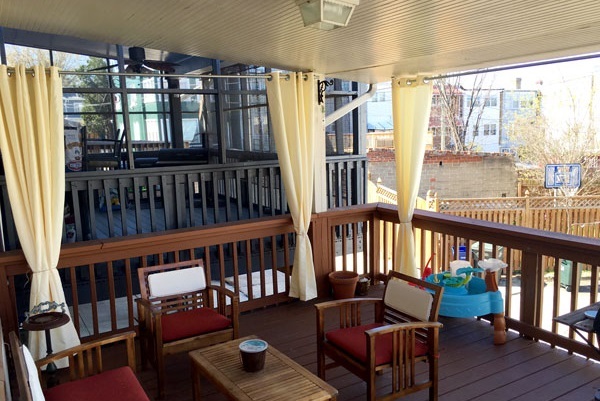 The angled curtain rod utilizes three fittings: the Swivel Flange, 90 Degree Elbow, and Rail Support fitting. Each of these fittings are locked into place by a set screw on the fitting, which can be tightened down using a set screw. Follow the diagram in Step 1 to assemble the curtain rod. The curtain rod should now look like the image in Step 2. From there, have someone help you hold the curtain rod in place while you attach it to the ceiling. Then, using the appropriate hardware (this will depend on what type of material you are attaching to, consult your local hardware store if you are unsure) mount the Swivel Flange. The Swivel Flange swings freely, so mounting this first will make it a little easier to work on the other side. The mounting plate on Swivel Flange has two holes in it for mounting (see the illustration in Step 3 for a closer look). Now, you can attach the other side by mounting the Rail Support to the ceiling. The Rail Support has a flat flange, so if the angle is too steep, you may need to use a spacer (like a piece of wood) or use another Swivel Flange here or even one of our other angled fittings. The flange on the Rail Support has two holes in it for mounting (see the illustration in Step 4). Once attached, you're all set! 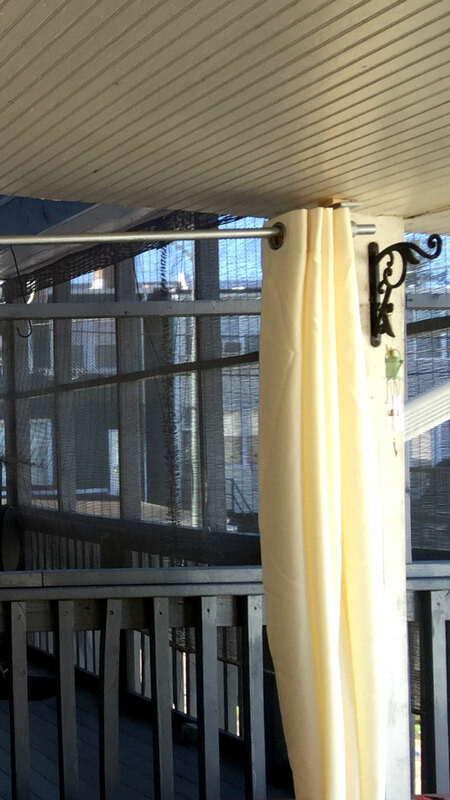 To add the curtain, you can loosen the set screws on the Rail Support and 90 Degree Elbow fitting to free the rod and slide on the curtain. If you have any problems assembling the curtain rod, or need some help designing a custom solution, don't hesitate to reach out to our projects team for assistance. Our team is experienced in using Kee Klamp and has helped many customers come up with their own perfect design. Did you enjoy this article? 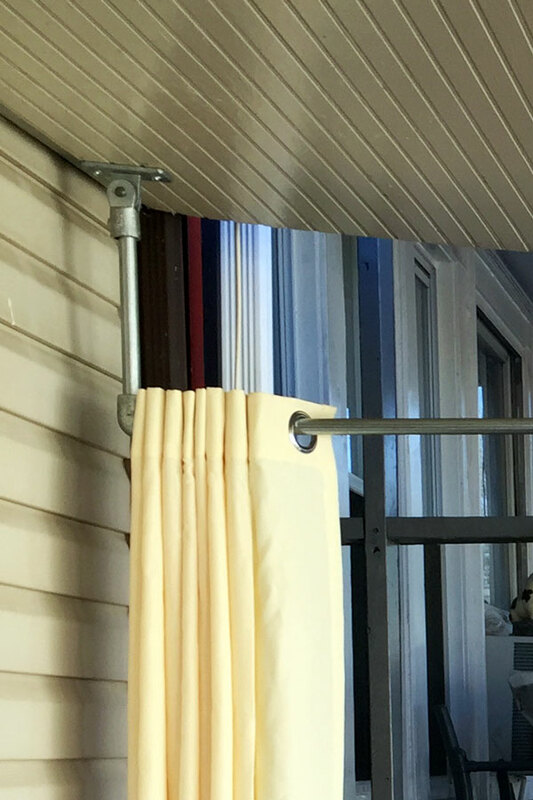 Let us know in the comments below what you thought of Kenneth's curtain rod and be sure to sign up to our email newsletter to receive updates on future projects like this one.